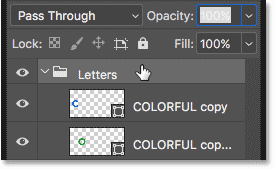 In this tutorial, I show you how to create an overlapping letters text effect in Photoshop, with colors that blend together where the letters overlap! 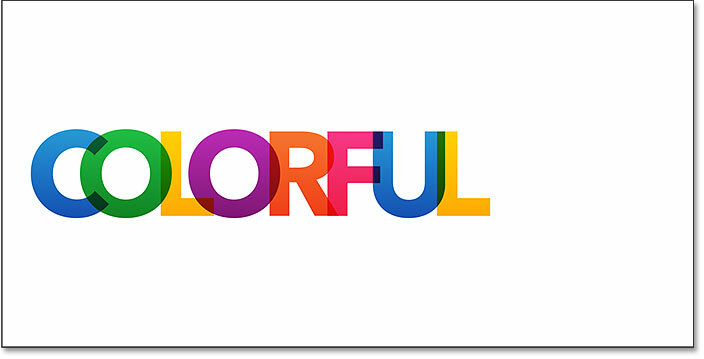 As we'll see, not only is this a fun and colorful effect, but it's also very easy to create. We just add some text, convert the letters into shapes, change the color of each letter, and then move the letters closer together to overlap them. 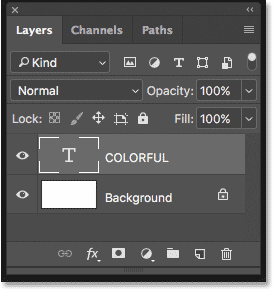 To blend the colors in the overlapping areas, we use one of Photoshop's layer blend modes. Let's see how it works! I'll be using Photoshop CC but every step is fully compatible with Photoshop CS6. Setting the options for the new document. Choosing the font and the type size. 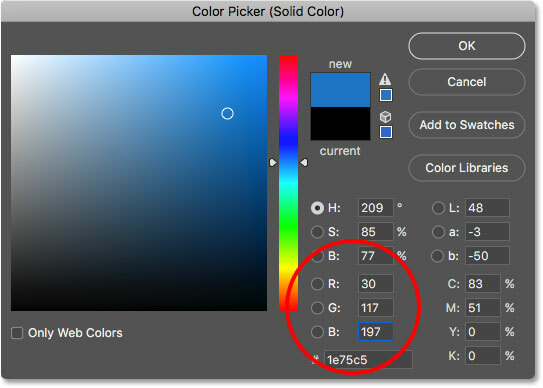 The color swatch in the Options Bar shows the current type color. Adding the initial text to the document. 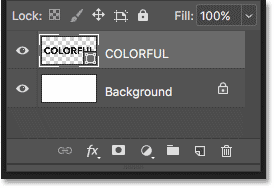 Photoshop places the Free Transform box and handles around the text. To resize it, press and hold your Shift key as you click and drag any of the corner handles. Holding the Shift key as you drag locks in the original shapes of the letters so you don't distort them. Make sure that when you're done, you release your mouse button first, and then release the Shift key, or you'll get unexpected results. Dragging a corner handle while holding Shift to resize the text. Going to Type > Convert to Shape. The Type layer is now a Shape layer. The text has been converted to a shape. 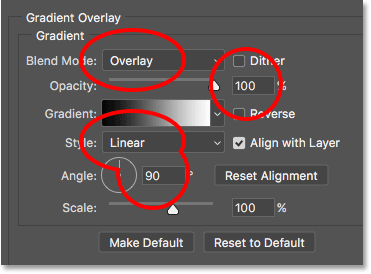 Changing "Select" to "All Layers" (Photoshop CC only). Selecting the first letter in the word. Going to Layer > New > Shape Layer via Cut. The first letter has been moved to its own layer. 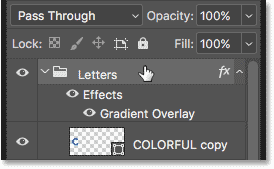 The Layers panel showing each letter in the word now on its own layer. 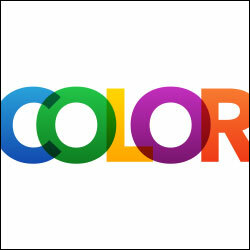 In a moment, we're going to change the color of each letter and move the letters closer together so that they overlap. 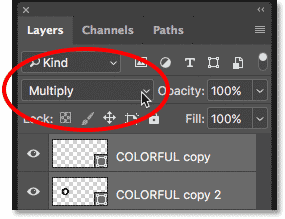 Since we want the colors in the overlapping areas to blend together, we need to change the blend mode for each Shape layer. 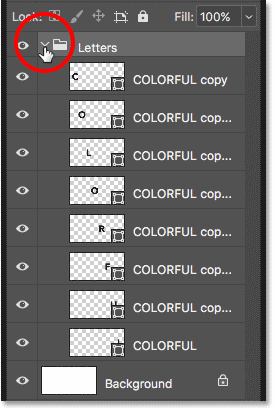 Photoshop lets us quickly change the blend mode for multiple layers at once. Selecting all the letters at once. Changing the blend mode of the Shape layers to Multiply. Choosing New Group from Layers from the menu. Viewing the Shape layers inside the group. 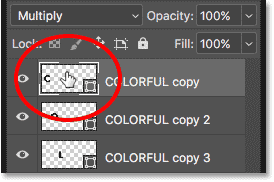 Double-clicking on the top Shape layer thumbnail. 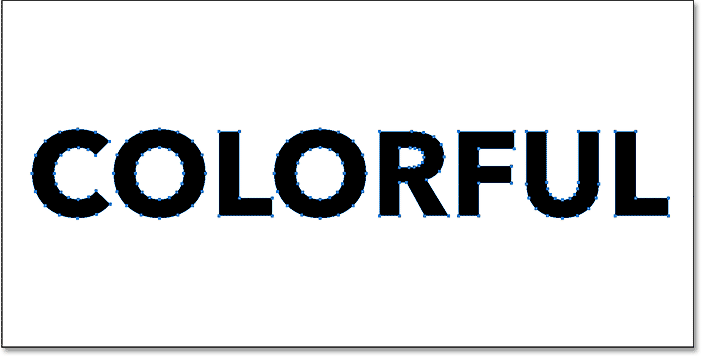 Choosing a light blue for the first letter in the word. The first letter is now light blue. 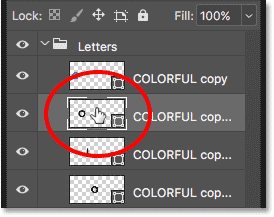 Double-clicking on the second Shape layer's thumbnail. Choosing a light green for the second letter. Two colors down, six to go. 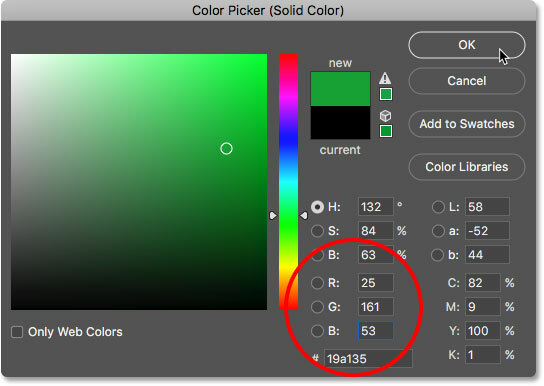 Continue changing the color of each letter in the word by double-clicking on its thumbnail in the Layers panel and choosing a new color from the Color Picker. 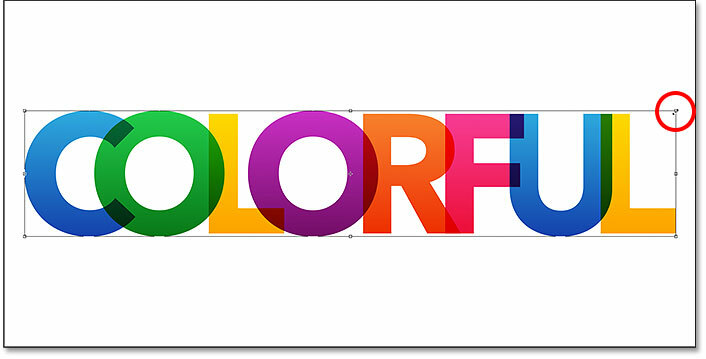 For the third letter ("L"), I'll choose yellow (R=255, G=190, B=0), and for the fourth letter ("O"), I'll go with magenta (R=158, G=33, B=150). For the "R", I'll use orange (R=244, G=99, B=36), and for the "F", I'll choose a bright pink (R=243, G=43, B=104). Each letter is now a different color. 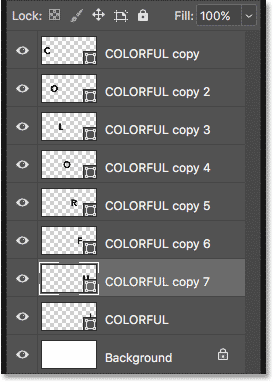 Selecting the "Letters" layer group. 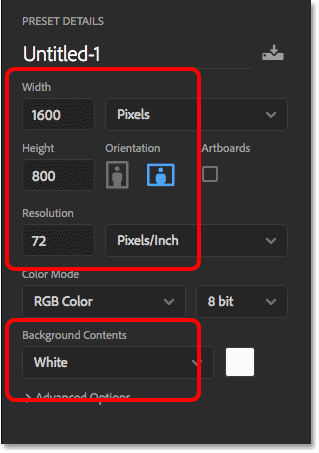 Adding a Gradient Overlay to the group is a quick way to turn flat colors into gradients. Turning on Auto-Select and setting it to Layer. Click on a letter to select it, then drag it over part of the letter beside it. The overlapping text effect is taking shape. If you do accidentally select and move two letters at once, press Ctrl+Z (Win) / Command+Z (Mac) to undo your last step. Click anywhere in the white background to deselect the letters, and then click on the letter you need to select it. The effect after moving each letter to overlap them. Resizing the effect with Free Transform. And there we have it! 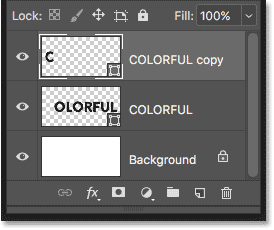 That's how to create an overlapping letters text effect, and how to blend the overlapping colors together, in Photoshop! Be sure to check out our Text Effects sections for more tutorials!